Data loss is one of the major problems in electronic devices. There are several reasons behind the data loss but whatever the reason will be, all the major companies on the internet will find such way anyhow, to make you buy their recovery products. Such recovery products include files recovery, those files can be your image files, video files, or documentation which you will find very important for you official work usually. But not everyone prefers the paid service especially when it comes to use such service for just one-time and waste the whole paid package for rest of the days of the month that you bought. When it comes to data recovery in Android device then we can’t say exactly about that people wanted to use recovery service to recover big document or files, because in most cases such thing can happen while the data get lost from your PC or Laptop. But in Android device usually, the image or sometimes video can be deleted. If you are looking to recover those deleted photos of you android then we have here to help you on that. We are showing you the method which will help you in that case. You can use this method for recover deleted photos from android internal storage as well as SD card. Most of the times the default setting is saved as to store clicked photos from your camera to your android internal storage, so you can recover deleted photos from your android internal storage too, but your device needs to be rooted for that. There are several applications for Android which provides images recovery facility. Some of them work and some don’t, but here are few applications that you can use which and will surely help you. 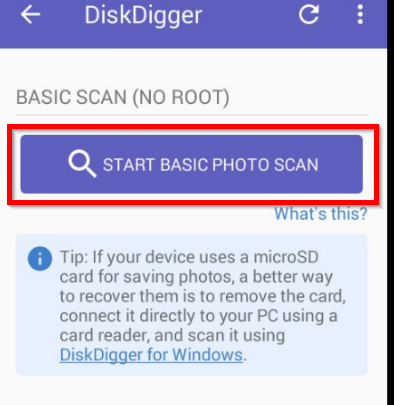 Download DiskDigger fro Play Store. Once you are done Download and installing this app, open it. On the first screen, you will see a button to START BASIC PHOTOS SCAN, click that button. 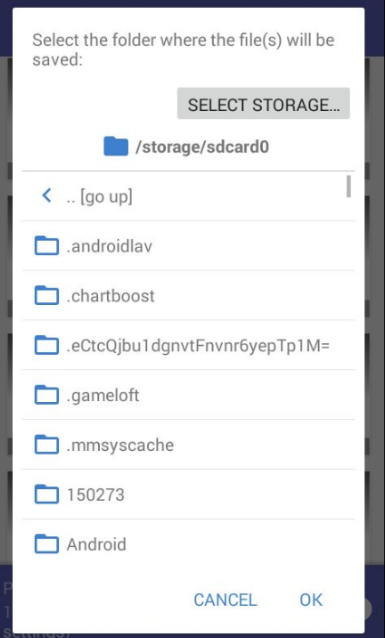 It will scan your Android device and you can now see all the deleted photos here. Select those photos you wanted to recover and click the recover button from the top of the screen. 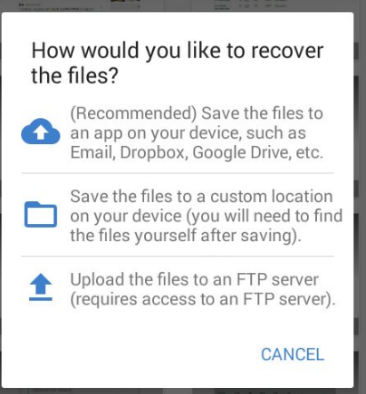 It will give you options to recover those photos on your android device, or upload to any cloud storage like dropbox or google drive or even you can upload them your server by choosing the FTP server method. If you simply want to recover and save those photos on your same android device then choose the middle option to save them on Android and locate the folder where you wanted them to be recovered. Once done, hit Ok.
After doing all above steps your deleted android photos will be recovered successfully. This all process can be done in the free version of DiskDigger. However, to avail more advanced options you can try its Pro version. Which will give you more advanced access, especially when your device is rooted. Download Dumpster from play store. Keep the app on your android device, if you delete any images or video file after installing then it will be deleted and the size will be reduced too, but calm you got the option to recover them from Dumpster. So, open Dumpster and you will see all your deleted photos and videos on Dumpster panel, all you have to do is select any photo you want to recover by just click on it. The other windows will slide in front of dumpster home screen, Click on Restore. The photo will be recovered right after clicking the recover button. Since all good working softwares are usually paid but here you are using it to recover deleted photos which can be just a temporary task. So we are giving the explanation on one of the paid services which gives trial version also and works perfectly fine. This is EaseUs which provides you a trial version of their recovery service for photos. Note: This Free recovery/trial version work only on rooted Android devices. 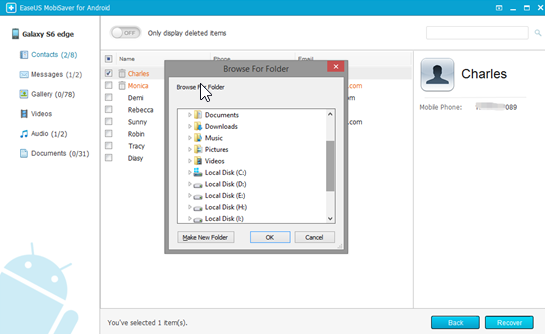 First of all, you need to download EaseUS Mobisaver, Download from here. Now install it and open it. Now connect you phone to your PC or Laptop using a USB cable and click on start button to make the software recognize and connect your device. When this software done connecting to your phone then the Second thing you have to do here is run a Scan, the software will scan the whole Android device and give you the structured detail fo existing and non-exiting/lost data files. Now choose the deleted photos you want to recover from here. You can also enable the “Only Display deleted items” option which simply display files which accidentally get deleted by you or such case happens. Now Select the files and Hit recover button, it will recover all the files you chose to recover. 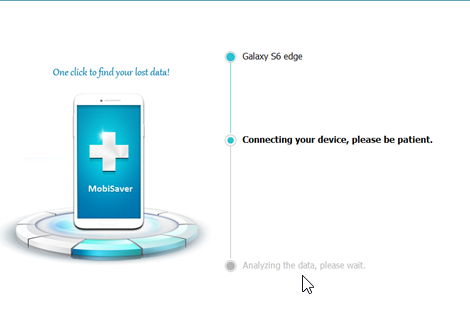 There are several other software available which can give you similar service like EaseUS Mobiserver to recover deleted photos from any Android device. But EaseUs recovery software is very trusted and will not harm your system anyhow.